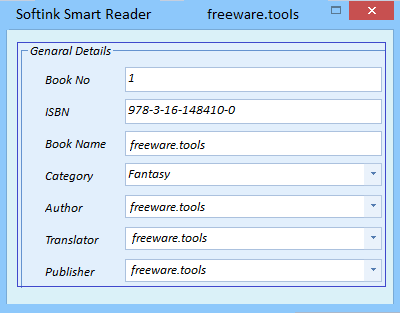 Smart Reader is a library management software which can be used to manage your home library. Smart Reader provides the facilities to store your books data at well organized platform. You can store images about the books also. Smart Reader supports for USB webcams so you can easily take your add your images via webcam. Smart Reader has the "Lending Facility" so you don't need to worry about the borrowed books because Smart Reader updates you about it. Also there is a strong filtering facilities so you can find the exact book what you need. There are book categorizing facilities, author information and publisher information storage facilities also. A large book collection is very difficult to organize, something every librarian knows all too well. Nowadays, however, you can take advantage of various specialized software solutions to make your job at least a little easier. Softink Smart Reader is a fairly straightforward application designed to help you manage your book library. It enables you to add detailed records for each item and offers multiple filtering options. The best way to keep your library in order is to store information about each item in a convenient manner. This application aims to offer a solution, as it allows you to enter each book’s name, ISBN, category, author, translator and publisher, as well as pictures captured with a webcam. Additionally, you can specify whether a book is yours and whether you have already read it. Also, you have the option of specifying when and for how long a book has been lent to someone else. The data entry process is not at all difficult, and things get even easier once you have added a certain number of authors, publishers and categories, as you can then just select them from a drop-down list. When you wish to find information about a certain book, you can use one or more of the multiple filters available. The application enables you to search for items based on their name, author, publisher, category or status. All in all, Softink Smart Reader is a relatively simple program specially designed to help readers organize their book collections. It features a minimalistic, if somewhat outdated interface, and it is not at all difficult to use.